What is indigestion or dyspepsia ? Dyspepsia is one of the most common ailments of the bowel (intestines), affecting an estimated 20% of persons in the United States. Perhaps only 10% of those affected actually seek medical attention for their dyspepsia. Dyspepsia is not a particularly good term for the ailment since it implies that there is “dyspepsia” or abnormal digestion of food, and this most probably is not the case. In fact, another common name for dyspepsia is indigestion, which, for the same reason, is no better than the term dyspepsia! Doctors frequently refer to the condition as non-ulcer dyspepsia. Dyspepsia (indigestion) is best described as a functional disease. (Sometimes, it is called functional dyspepsia.) The concept of functional disease is particularly useful when discussing diseases of the gastrointestinal tract. 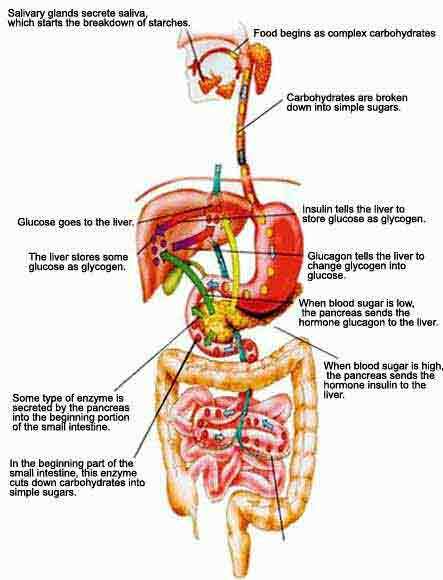 The concept applies to the muscular organs of the gastrointestinal tract-esophagus, stomach, small intestine, gallbladder, and colon. What is meant by the term, functional, is that either the muscles of the organs or the nerves that control the organs are not working normally, and, as a result, the organs do not function normally. The nerves that control the organs include not only the nerves that lie within the muscles of the organs but also the nerves of the spinal cord and brain. Some gastrointestinal diseases can be seen and diagnosed with the naked eye, such as ulcers of the stomach. Thus, ulcers can be seen at surgery, on x-rays, and and by endoscopy. Other diseases cannot be seen with the naked eye but can be seen and diagnosed under the microscope. For example, gastritis (inflammation of the stomach) is diagnosed by microscopic examination of biopsies of the stomach. In contrast, gastrointestinal functional diseases cannot be seen with the naked eye or with the microscope. In some instances, the abnormal function can be demonstrated by tests (for example, gastric emptying studies or antro-duodenal motility studies). However, the tests often are complex, are not widely available, and do not reliably detect the functional abnormalities. Accordingly, and by default, functional gastrointestinal diseases are those that involve abnormal function of gastrointestinal organs in which the abnormalities cannot be seen in the organs with either the naked eye or the microscope. Occasionally, diseases that are thought to be functional are ultimately found to be associated with abnormalities that can be seen. Then, the disease moves out of the functional category. An example of this would be Helicobacter pylori (H. pylori) infection of the stomach. Some patients with mild upper gastrointestinal symptoms who were thought to have abnormal function of the stomach or intestines have been found to have stomachs infected with H. pylori. This infection can be diagnosed under the microscope by identifying the bacterium. When patients are treated with antibiotics, the H. pylori and symptoms disappear. Thus, recognition of infections with Helicobacter pylori has removed some patients’ systems from the functional disease category. The distinction between functional disease and non-functional disease may, in fact, be blurry. Thus, even functional diseases probably have associated biochemical or molecular abnormalities that ultimately will be able to be measured. For example, functional diseases of the stomach and intestines may be shown ultimately to be associated with reduced or increased levels of normal chemicals within the gastrointestinal organs, the spinal cord, or the brain. Should a disease that is demonstrated to be due to a reduced or increased chemical still be considered a functional disease? I think not. In this theoretical situation, we can’t see the abnormality with the naked eye or the microscope, but we can measure it. If we can measure an associated or causative abnormality, the disease probably should no longer be considered functional. Despite the shortcomings of the term, functional, the concept of a functional abnormality is useful for approaching many of the symptoms originating from the muscular organs of the gastrointestinal tract. To repeat, this concept applies to those symptoms for which there are no associated abnormalities that can be seen with the naked eye or the microscope. While dyspepsia is a major functional disease(s), it is important to mention several other functional diseases. A second major functional disease is the irritable bowel syndrome, or IBS. The symptoms of IBS are thought to originate primarily from the small intestine and/or colon. The symptoms of IBS include abdominal pain that is accompanied by alterations in bowel movements (defecation), primarily constipation or diarrhea. In fact, dyspepsia and IBS may be overlapping diseases since up to half of patients with IBS also have symptoms of dyspepsia. A third distinct functional disorder is non-cardiac chest pain. This pain may mimic heart pain (angina), but it is unassociated with heart disease. In fact, non-cardiac chest pain is thought to result from a functional abnormality of the esophagus. Functional disorders of the gastrointestinal tract often are categorized by the organ of involvement. Thus, there are functional disorders of the esophagus, stomach, small intestine, colon, and gallbladder. The amount of research that has been done with functional disorders is greatest in the esophagus and stomach (for example, non-cardiac chest pain, dyspepsia), perhaps because these organs are easiest to reach and study. Research into functional disorders affecting the small intestine and colon (IBS) is more difficult to conduct and there is less agreement among the research studies. This probably is a reflection of the complexity of the activities of the small intestine and colon and the difficulty in studying these activities. Functional diseases of the gallbladder (referred to as biliary dyskinesia), like those of the small intestine and colon, also are more difficult to study, and at present they are less well-defined. Each of the functional diseases is associated with its own set of characteristic symptoms. Indigestion is not a disease but maybe a sign or symptom of a disease. Around 20 percent of the American population suffers from this medical condition, and often stomach upsets are relieved on its own. Gas is often passed out through flatulence or belching because of the increased acid production in the stomach. Introduction of food in the stomach increases acid production. With this in mind, people found to be suffering from ulcers are advised to take frequent light meals instead of the normal three heavy meals. One misconception is that eating food alleviates the pain in ulcers when it fact it increases acid production. Indigestion and heartburn are often interchanged. Indigestion is usually a symptom of heartburn (GERD). However, indigestion is an entirely different medical condition. Causes of indigestion or stomach upset are overeating and eating types of foods which may not agree with your stomach. People may have eaten something which may have been undercooked, steaks which may be rare or medium rare for example. Some types of foods make the stomach work twice as hard, making it difficult for the stomach to break them down. Other people may have problems eating certain types of foods which cause increased acid production. Pregnancy can also cause indigestion. Pregnant women are advised to eat small frequent meals because of their condition. The developing baby exerts pressure on the stomach. When heavy meals are taken, normal stomach expansion does not happen because of the baby’s presence. Overeating also causes indigestion. There is just too much food so that your stomach can not digest everything. Meals which are not taken at regular times also cause indigestion. Psychological factors such as stress can also cause indigestion. Smoking and drinking alcohol also cause stomach upsets. Cigarettes and alcohol contain chemicals which may irritate the stomach and cause people to suffer indigestion. For people suffering from chronic indigestion or those which lasts for days and accompanied by other symptoms, it is important that they consult their doctors for medication. Indigestion is one of the most common symptoms for digestive deseases and disorders. Dyspepsia maybe classified as organic or functional. The two types are differentiated by the factors which cause indigestion. Dyspepsia is classified as organic when the medical condition is a result of a medical disease or known cause. Common causes include diseases such as chronic peptic ulcer, chronic pancreatitis, gastro esophageal reflux disease (GERD), gallstones and other major digestive diseases. Indigestion or dyspepsia is classified as functional when the factors which cause it are unknown or undefined. Indigestion maybe caused by abnormal motor functions which interfere with the normal digestive process. Examples of these may be psychological in nature, such as stress or other factors such as smoking. Older people are also more susceptible with bouts of indigestion, as normal digestive system movements or peristalsis decrease with age. Although stomach upsets or indigestion are often treated by simple medications such as antacids, people suffering from chronic indigestion should consult their doctors as frequent indigestion might be a symptom of a more complicated disease. An ounce of prevention is always better than a pound of cure; it is definitely more economical too. Indigestion is a fairly common medical condition which is caused by simple lifestyle habits. Understanding which types of food don’t agree with your stomach can go a long way in preventing indigestion. Knowing your limits in terms of the amount of food eaten and the alcohol consumed can reduce the amount of acids produced by the stomach. Learning to eat meals at regular intervals and avoiding stressful situations could reduce instances of upset stomachs. Resting after eating is one way of avoiding indigestion, letting your body undergo the process of digestion before exercising and working is also advised. Taking medications such as antacids which reduces acidity in the stomach provides relief from discomforts suffered from indigestion. Antacids don’t reduce the production of acids in the stomach but they neutralize its acidity. This is similar to adding sugar in coffee to reduce its bitter taste. Next to the common cold, stomach upsets are one of the major reasons why people miss work or school. Indigestion or stomach upset is common, and it is often seen after taking in large meals during celebrations and holidays. Stomach upset or indigestion are terms that have been used to describe many symptoms associated with digestive conditions. Stomach upsets are so common that they are often dismissed as simple colds or fever. But unlike colds and fevers, when bouts of indigestion continue for long periods of time they might signal that a person is suffering from a more serious medical condition. Eating right and having regular meals during the day could go a long way in preventing indigestion. When holidays come and for sure they will, it is always important to remember to eat in moderation. Other factors such as stress and smoking have also been discovered as contributing factors to indigestion. Smoking and drinking is a personal choice we make, but drinking too much and smoking has been discovered to cause serious medical diseases. These symptoms may increase in times of stress. Who Is at Risk for Indigestion? Or pl advise any other effective medicine for this.Thanks. It’s primarily from very spicy food or drinking the night before. I need my doctor to prescribe me something for my acid reflux, but in the meantime I am wondering what I can do now. Whether it be quick fixes, natural remedies, or over the counter medication. I’ve tried drinking milk, pickle juice, and eating raw potatoes which all actually work fairly well. My stomach does not hurt that often, but when it does, I always feel like I am going to throw up. No, I am not pregnant and it only happens sometimes and I am wondering why that could be. I would go to the doctor, but I am not too concerned about it and I do not have insurance anyway; I am just curious to know. I have tried the internet, but I have not had much luck. Also, has this sort of thing happened to you or am I just weird? Thanks in advance. I would like ideas for washing and treating Rosacea pimples. Also what is a good makeup and moisturizer to use? are they the same thing? or are they different things? i was just curios. what treatments are best for which? I feel like I am on a dock or elevator when I walk. Sometimes I feel tired during the day. My right ear pops when I swallow laying down. Occasionally it has its own heartbeat. Under my ear and in front of my ear twitches sometimes. All of this has been happening for two weeks now. Can allergies cause all of this? I never had allergies before but my doctor once told me that I am at the age where most people start to get allergies. I am 22 years old.